I have grown the perfect Cabbage Patch Kids Cabbage. I could fit my 14 month old into the wrapper leaves of this beast without too much work. I don’t want to fish for complements here, but really – have you ever seen a nicer cabbage? 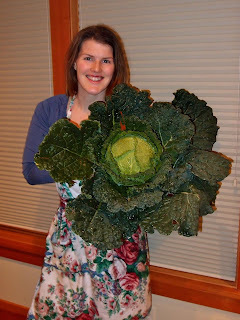 The cabbage in question is named Melissa, and she is a savoy variety. You don’t see savoy cabbages so much in the stores. The smooth head varieties like Stonehead, Golden Acre and Danish Ballhead seem to dominate the commercial market. Around here, exotic cabbage texture seems to be reserved for the Asian greens, with Napa cabbage taking pride of place over the old reliable that is the savoy cabbage. That’s a pity, since – as a rule – the savoys hold up beautifully to a Maritime Northwest winter, easily shrugging off temperatures in the high teens and months of drizzle. January King is a deservedly famous savoy variety known to be especially rugged in the winter garden. As its name implies, it hits its stride when snow is on the raised beds and frost is on the windows. Melissa is a mid-season variety, and hence at her peak a bit earlier, but if you time her right she will coast into cooler weather at full size, holding harvestable in the semi-stasis of fall for weeks or months on end. And the flavor? Perfect, in a word. Personally, the longer I garden the more my taste buds climb toward the robust and the hardy. The smack-me-up flavors of mustard greens and the sweet, minerally flavor and chewey texture of Kavalo Nero kale hold just as much charm to me as a delicate, melting butterhead lettuce or the universally appealing and unoffensive sweetness of a snap pea. To my palate, the crinkled leaves of a savoy cabbage lean just a bit closer to its kale forbearers in flavor than the smooth coleslaw varieties one can buy in the store 365 days a year. I love cabbage in all its forms, and would turn down neither a dense softball of smooth leaves or the loose rosette of a blownup Napa. But after a hard frost, the savoys blossom in flavor, sweetening into something even a Cabbage Patch Kid would chew on eagerly. There is something about the savoy varieties that says: this is the cabbage that kept your Irish ancestors from starving in the cold of winter. This is the cabbage that fed the Chinese who labored along the railroad. This is the cabbage the Dutch pickled for long sea voyages to hold scurvy at bay. To be perfectly frank, I’ve no idea what variety cabbage the Irish, Chinese and Dutch survived on during their many trials, but as I hoist Melissa into my home on a clear November day, it feels like it must be the savoys that sustained them all. I love savoy cabbage – especially for making cabbage rolls. Love! Unfortunately our cabbage got a bit of a late start this year so I'm hoping I at least get something from them. We grow the January King, which I've only been able to find at Territorial here. It's much more popular in Europe. Absolutely gorgeous! Almost hate to cut into it! Just in case anyone's wondering, I am particularly proud of my cabbage harvest this year since it took me 4 years of gardening to get a single cabbage to head. So if big photo worthy cabbages seem like something "other people" can grow, please know that they were that way for me for a very long time. But it was *so* worth the effort that it took to figure out timing for my area. It looks great Erica – well done 🙂 What delicious dish have you got planned for that one? Jamie Oliver has a Savoy Cabbage and Farfalle pasta recipe that everyone thinks sounds pretty ordinary but once they try it are a bit impressed. That is one gorgeous cabbage! 1st rule of farming: Don't name the pets. Well, just don't get the big head over that big head (of savoy). That is an awesome looking head of cabbage, whatever kind it is! That cabbage is enormous! I'm not a big fan of cabbage for eating, but I love plants with huge leaves, so I'd grow that just for its ornamental value. Have you grown Brussels sprouts? The timing on them is tricky too, I tried this year and couldn't get it right. My husband calls them fairy cabbages.